You will struggle to find a more stylish way to travel the seven seas than aboard the Seabourn Odyssey. It’s a small ship that’s big on luxury and provides everything you could need on board. The Seabourn Odyssey is the definition of a luxury cruise. Over the last couple of decades, Seabourn has managed to establish itself as the industry leader at the high end of the market. If you are still not convinced, have a look at their long list of awards which include accolades from Conde Nast, Cruise Critic, and The American Academy. These awards have recognized everything from their food, to their spa, and even their value for money. Seabourn is known for running smaller, more exclusive cruises which avoid the common pitfalls of the cruise industry. It has a small fleet of just six ships, all of which are modern and run a variety of routes across the globe. The Odyssey is one of their newest boats, and therefore represents the most up-to-date experience they have to offer. The ship is spacious and comfortable, the staff are attentive, the entertainment is of the highest quality, and the food is as delicious as it is varied. Its public spaces feel modern, and the suites can rival all but the fanciest of hotel rooms. With only 255 suites, it is also much smaller than most cruises. This, combined with the large spaces on board, means that it never feels crowded. The ship attracts a variety of people. There were the avid cruisers you would expect, as well as some honeymooners, and even the odd celebrity! The age range of the guests was slightly skewed towards the older generations, but not by nearly as much as we feared it could be. There were also no children onboard and the Odyssey is not set up to support them (there are no climbing frames or water slides here!). Being at the high end of the cruise spectrum, there is also an element of formality to the ship. During the day resort-wear is fine, but at night the suits and evening gowns come out. You might have trouble getting admittance to some of the events without some nice clothes and for us this posed a small problem, as being constantly on the move, we didn’t have these things to hand. There are seven different types of suites available so you can easily find something that matches your budget. I use the word suite instead of cabin because they were nicer than the word cabin suggests, and also because they all have seating areas which can be separated by curtain from the bedroom. We stayed in one of the Verandah Suites which gave us plenty of space and our own balcony space (our advice is to always get a balcony). It was sumptuously decorated and had all the amenities we needed. There were plenty of power outlets and adapters, as well as a hair dryer in the bathroom. There was also a walk-in closet which gave us the rare luxury of being able to completely unpack for the duration of the cruise. For entertainment there was an iPod dock as well as a flat screen TV complete with a great selection of movies and music. These were available at no cost as were the drinks with which they filled the fridge. At check-in we were asked what we liked which was a nice personal touch, and our fridge was stocked with IPA beers for Chris, and wine for me. These things go for all the suites, so the only real difference between them is whether you have a balcony, and how much space you want – something to keep in mind when booking. When we weren’t docked and out exploring, we spent much of our time enjoying the entertainment options on the Odyssey. Now the thought of cruise ship entertainment can conjure up images of cheesy Vegas style productions with way too much pizzazz, but on this ship it was different. They had a carefully curated assortment of performers, and these included plenty of mellow options. Those looking to continue the party after a show, can head on to the nightclub which features a large dance floor and an outdoor terrace, with a selection of great cocktail on hand. If you want to entertain yourself however, there are also many things to do on board. You can visit the casino to try your luck (I won $80 on blackjack so I consider this a good option! ), or out to enjoy the Mediterranean sun in the pool. Actually, this is a good option even if the weather isn’t great – we spent one rainy day in the jacuzzi enjoying the sensation of the rain falling on us as we sat in the hot bubbling water. Within minutes a server appeared with a bottle of bubbly, and soon we were laughing, singing, and having a good time. I think we even inspired some of the other passengers to give it a go themselves! There are is also a games room where you can play cards, a spa, and even a nine hole putting green. Finally, there are three bars if you fancy a drink and these can be found both inside and outside. We spent some lovely evenings in the Observation Bar watching the sunsets while enjoying a cocktail. One place where the Odyssey really excels is its dining. 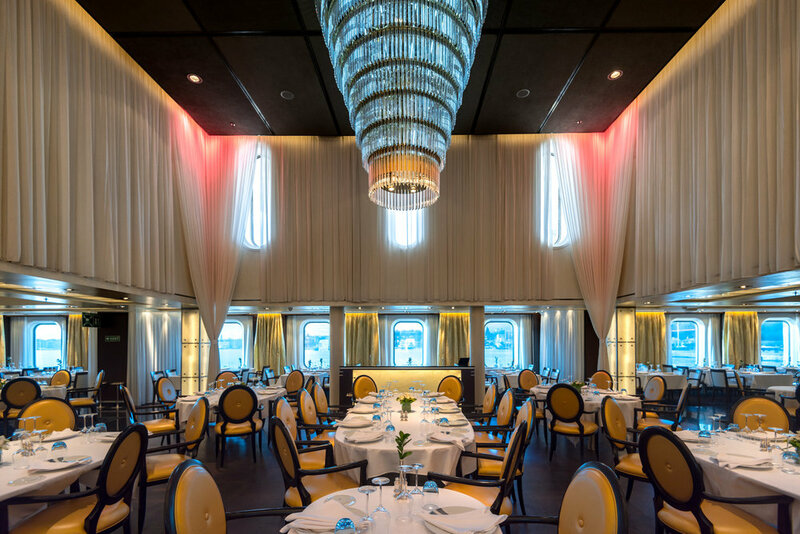 There are three main restaurants on the ship, and a further two places (the patio bar by the pool, and the Seabourn Square area on deck seven) where you can get hot food. The company has teamed up with Thomas Keller – the American celebrity chef – to produce some of the ship’s menu, and most evenings one of the restaurants will be having a "Keller night". If you see his name on the menu, your restaurant is having one and you can be sure you are in for a treat - there is a noticeable difference between his food and that which is served on other occasions. If you want to dine in ‘the Restaurant’ you will need to make a reservation, and there is a smart-casual dress code which you will need to adhere to. There was one night which was strictly ‘jackets for men’, and we were unfortunately turned down for entrance that night (you might have realized that Chris is not really a jacket wearing kind of guy). All was not lost though, as we ordered room service and enjoyed an excellent meal out on our balcony - this is something you should do at least once while on this cruise. The menu in the restaurant is modern and draws on a range of different cuisines, so you will most likely find something to please everyone. Another option is ‘Restaurant 2’ which offers a more fine dining experience with a selection of smaller tasting plates. This one is smaller and extremely popular – we were unable to get a table there for the duration of the cruise, hopefully next time we will get a chance to try it! The final restaurant proper is ‘the Colonnade’ which is where we would have breakfast and lunch. Everyday the theme changes, and on our trip there these included Mexican, Greek, and Italian. They also have a buffet with an array of fresh healthy options if you are not a big fan of the day’s theme of choice. In the evening it changes into a bistro, and this is where you come for a more casual alternative to the two ‘restaurants’. Of course, you go on a cruise for the destinations not just to spend time on the ship, and once you dock, you have the choice of going out alone or taking one of the organized excursions. These are uniformly amazing, and are what makes a Seabourn cruise extra special. As you would expect, they offer tours of each location but, thanks to their partnership with UNESCO, these are of a higher standard than the average and you are guaranteed to come away having learnt something new. There are however, several options for each place you visit, so if you don’t feel like going on a tour, you can do one of their action excursions. These vary depending on the route and specific destination, but there is always something exciting to do. Depending on where you are, you might go mountain biking, kayaking, or scuba diving. These activities usually incorporate the specifics of the place in which you find yourself, so you can go looking for turtles in Barbados, while in Bali you could choose to hike to traditional villages on the slopes of a volcano. A final option is to have them organize a hire car, and go out exploring yourself. The excursions cost extra and must be booked in advance. They can get pretty popular so don’t leave it to the last minute or you might end up regretting your lack of decision. By the end, we were delighted that we had given this cruise a go, and will likely be returning for another at some point in the future. All our preconceptions were shattered by the elegance and quality of pretty much every aspect of the experience, and we came away having visited some beautiful places in comfort and style.